Designing a wireless network that cost-effectively delivers seamless roaming can be a real challenge. As a custom installer, it’s important to understand some of the intricacies of Wi-Fi in order to provide the best roaming experience to your customers without breaking the bank. As with any discussion about roaming, it’s important to first understand that the decision to roam is determined by the client device. Wi-Fi was originally conceived with the idea that there would be very few Access Points (APs), so client devices were designed to hang on to an AP as long as possible. This means that even if a client can talk to an AP with better signal quality, it may stay attached to another AP simply because that is where it was connected first. Roaming in a Wi-Fi network occurs when the client’s device decides to detach from one AP and reattach to a different one. You might think that if a client ‘sees’ an AP that can provide a stronger signal or better signal quality, it would initiate a roam and try to attach to the AP with the best network link. Unfortunately, this isn’t how roaming works. Large space with three Access Points (APs) for adequate coverage. To demonstrate, let’s look at how a typical device roams. When a device attempts to connect to a Wi-Fi network, it will first search for APs. When it finds an AP to which it can authenticate, it will connect and participate on the network. 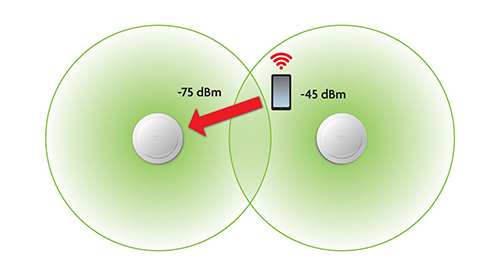 As the client device moves around and away from the connected AP, the signal level and quality will degrade. The client may move closer to another AP with a better signal level and quality, but it won’t connect to this AP because it’s really only aware of the AP to which it’s already connected. It won’t search for new APs until the signal from the attached AP deteriorates to a point where there is little, if any, capability to exchange data. Once the client reaches this level, the user is probably already unable to stream video, talk over VoIP or control their Wi-Fi-enabled thermostat. Eventually by the time the client decides to scan for a new AP, this all-too-common scenario has already resulted in an unhappy Wi-Fi user and a dissatisfied customer. Wi-Fi client device in a standard multi-AP wireless network. The client is “stuck” to an AP with lower signal strength and little to no connectivity, even though a nearby AP with better signal strength is available. The best way to improve the customer roaming experience is to add a Wi-Fi controller to the network. A true controller can prompt client devices to move seamlessly from AP to AP, always trying to maintain the best signal quality. The wireless controller has an advantage in that it communicates with all of the APs and monitors connected clients, giving it a ‘big picture’ view of the network. The controller tracks each client and how the APs see them, allowing the controller to determine which AP will provide the best signal quality for each client. 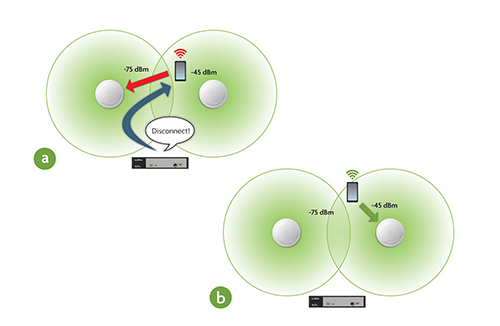 The controller determines that the client could be connected to a nearby AP with better signal and sends a disconnect command to the client. (b) The client disconnects, then connects to the AP with the better signal. It is important to note that not all wireless controllers make roaming better. Some wireless controllers simply make deployment and management easier. While faster deployment is a worthy cause, this class of product would be more appropriately called a “wireless configurator”. Some wireless controllers offer advanced tracking and reporting on client network usage, device location, domain controller integration and rogue access point detection. While these features can be crucial in enterprise applications, they may not be so useful in most residential or light commercial application. So, be sure to evaluate your customer’s budget and needs so as not to unnecessarily incur additional costs for your business and your customers. It simply doesn’t make sense to pay for expensive capabilities you and your customers won’t ever use. Consider also that wireless controllers and APs work together as a system. There are many different choices for Wi-Fi controllers, but don’t expect a controller from one vendor to work with APs from another vendor. Your customers need stable, secure and useable Wi-Fi, and they need it in increasingly larger spaces and under more challenging conditions. Determining the best wireless solutions will require a little homework on top of considering customer requirements and budgets. 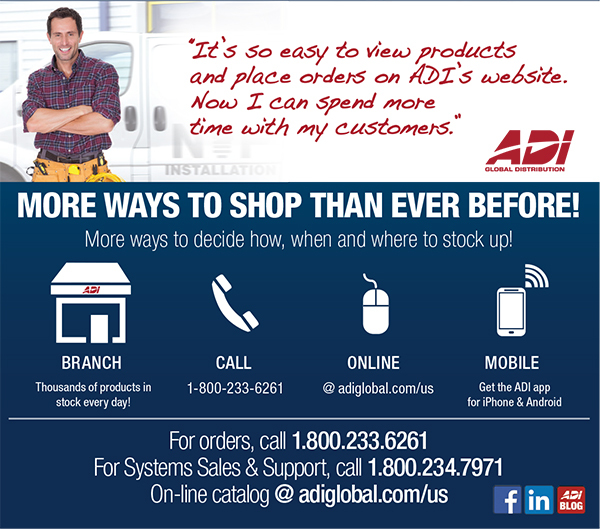 As an integrator, what you really care about is simple installation, high-quality and cost-effective hardware, good support when you need it, and happy customers that won’t need expensive follow-up service calls. The right wireless controller can help you meet those needs.